Use your slow cooker to get this classic Italian meat sauce generously packed with beef, pork, and veal. Cabernet Sauvignon or a Malbec red wine add a nice richness to the sauce, but any variety of red wine is fine. Per Serving: 518 calories; 30g fat; 28.4g carbohydrates; 30g protein; 91mg cholesterol; 206mg sodium. This was a really good ragu bolognese. I love the use of the pappardelle. 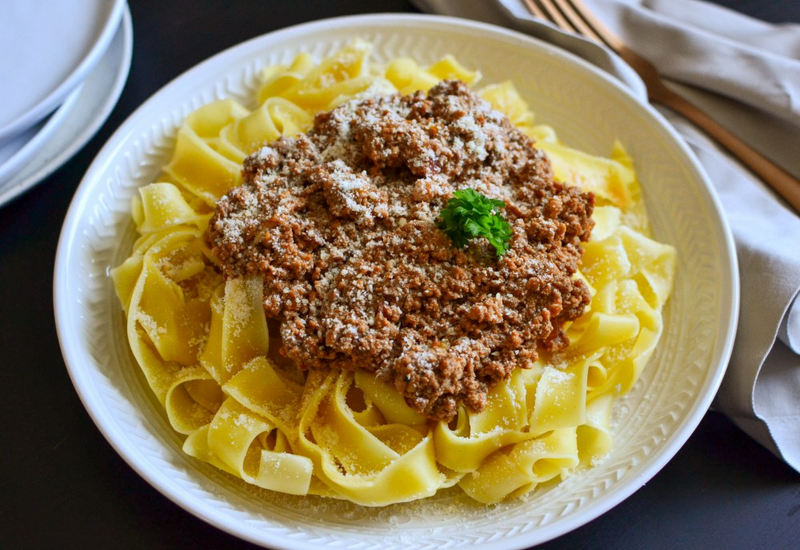 It's becoming increasingly easy to find at the store and it's such a thick and sturdy noodle which makes it perfect for this hearty meat sauce. I loved the flavor of this ragu bolognese, although the consistency did not hold up for me as much as I would have liked. Maybe next time I will use less broth. Still, I thought this recipe was really good and I'd make it again without a doubt. Perfect ragu sauce, very flavorful. The red wine gives it an extra kick of flavor. Very good, authentic recipe! Please stop using red pepper flakes in pasta recipes.